I’ve been sitting on this post for awhile, because I wanted to make sure I posted it in the most appropriate light. I do know, however, that some of the best, most viewed posts I’ve ever written, I tried not to over think it and just wrote. So, that’s what I’m going to do here, too. A few weeks ago while I was at work, I had the unforeseen opportunity to meet a young girl who was (is) going through a difficult time. In my business, when you’re the only manager working on a weekend day, often times you find yourself running store end to store end, helping employees, customers, really whoever- wherever you’re needed. The day I met Zoie, the day slowed down more than it ever has , and if possible, for few moments, the day actually stopped. Zoie had come into my store accompanied by some of her new foster family members in the middle of a snowy Saturday afternoon. After not being able to locate her for several minutes, one of her family members asked me to help them track her down, as she was 14 so it wasn’t “quite an emergency,” but they still couldn’t find her on their own. After a brief conversation with her foster mother following the request, she had shared with me that Zoie may have been trying to purposely not be found within the store and that she had told the foster mother she might take pills before running away from her as they entered. This was approximately a half hour after Zoie had not been located within the building. At this time, I asked my team to take a look in their areas to see if they could see anyone matching Zoie’s description. Moments later, I was called to a section of the store by someone who believed they were next to Zoie. As I approached her, I could tell she was under some kind of influence and wasn’t mentally present as I spoke with her. She was trying to bite the lid off of a mouthwash bottle, and told me she wanted to drink it. While I think many of us know the purpose in which she wanted to do this, I felt my experience in crisis counseling and intervention started kicking in and made me determined to get not only the mouth wash away from her, but her mind onto something else. At this point I signaled for the other employee with me to call 911, while I convinced Zoie to hand me the mouth wash (since she was unable to figure out how to open it) so I could help her find a different one. (I said this to try and buy time and to speak with her about herself and other subjects). As we traveled aisle to aisle I asked customers to politely back away, as Zoie grabbed numerous items off the shelves trying to open them as she swayed side to side and appeared more disoriented as minutes went by. When she successfully pulled the cap off of a half gallon bottle of soap, she began drinking it quickly before I pulled it out of her hands, asking her to spit out the contents. Rather than do what I asked, she tilted her head back, trying to swallow what she could. At this point it was certain, Zoie was looking for a way to end her life. Seconds later, in a back corner of the store, Zoie was no longer able to stand and fell to her knees, before laying on the ground as I sat next to her and began asking her questions about why she was doing this. She tells me she had taken a bottle of allergy pills when entering the store and shows me where she dumped the empty bottle. Out of 70 pills in the container, she tells me she only took about 65, because a few fell on the floor in the bathroom. The situation that I had originally thought I was entering was completely different. Zoie told me she wanted to die. She asked me that I leave her where she was on the floor and to let her die slowly. As I sit on the floor aside of her, rubbing her back, I tell her I won’t walk away from her because I care about her and she means a lot to me. She doesn’t believe me, telling me I don’t know who she is and that I can’t care about her life if I don’t know her. I assure her that I care for her wellbeing and try to tell her no matter what her circumstance is, tomorrow is a fresh start, and that there are people who care about her, myself included. The distress Zoie was feeling is real. The pain is real. The regular absence of her real mother, whom she so desperately wanted a relationship with- real. The kids whom she told me make fun of her at school, they’re real too. Life and circumstances have not always been pleasant for Zoie, and I could see the accumulation of all her angst in front of my eyes. As you can imagine, it was scary beyond belief, but more than that, it was surreal. When you see someone hurting, and know you need to do what you can to help them, a different reality kicks in. For Zoie, it was the sincerity that my team and I wanted to make sure she was okay and got the help she deserves. Zoie was taken to the hospital that day, where I was told the next day that she was released hours prior to my phone call. I tried reaching Zoie at the hospital, because I wanted to confirm my words to her. I wanted Zoie to know that people, although she didn’t know them, cared for her and wanted to know she was okay. I’ll most likely never see Zoie again, nor will I get to tell her the impact she made in my life or how much she truly does means to me. We all carry our crosses, some are heavier than others and some come at different times in our lives. I think of Zoie often and pray for her wellbeing, and through this make sure to spend time with and spread love to the people around me as often as possible. 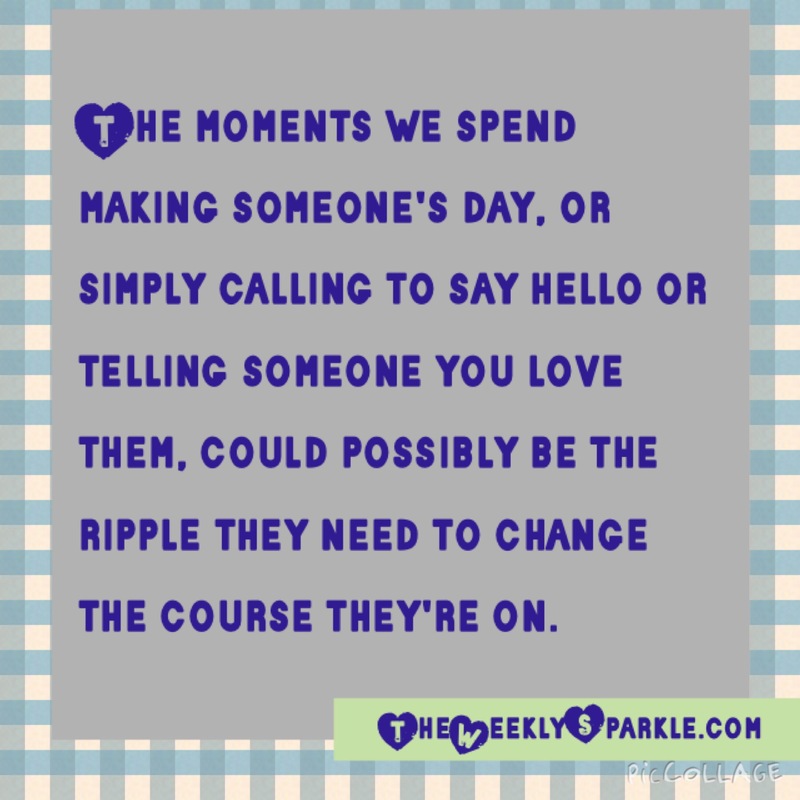 The moments we spend making someone’s day, or simply calling to say hello or telling someone you love them, could possibly be the ripple they need to change the course they’re on. If you ever find yourself feeling alone or wanting to hurt yourself, there are people that care for you and want to help you, even if it doesn’t feel like that right now. Call that one family member, friend, teacher, anyone… Because all of us have someone who cares for us, even if we don’t know them.